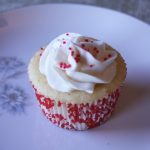 UPDATE: If you love Doce de Tomate jam you will also love my cake version! The recipe for my Doce de Tomate inspired cake is now available in my eBook, Cakes without Borders. So the first question you probably have is “what the heck is doce de tomate?”. 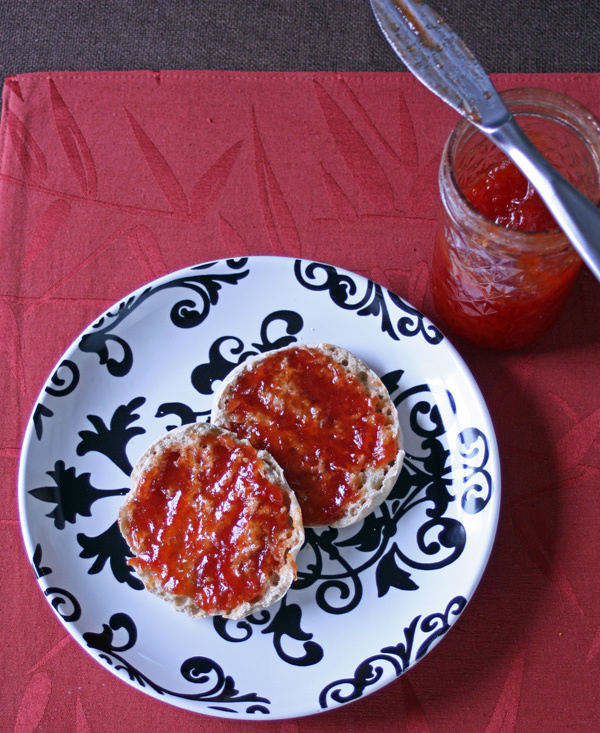 Well it’s tomato jam, and it’s awesome. You would never guess it is made of tomato. It’s sweet with a hint of cinnamon and so smooth. I’ve put it on crackers, toast, English muffins and even a slice of pound cake! Your next question is probably, “what made you want to make tomato jam?” Well, I was recently doing some research for my upcoming book (I haven’t decided on a title yet but it will be all cake recipes inspired by the countries of Europe) when I stumbled across a recipe for Doce de Tomate in a Portuguese cookbook called The New Portuguese Table. I had the opportunity to visit Lisbon, Portugal a number of years ago. 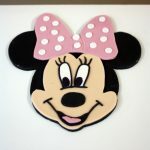 It was only a day trip but I absolutely loved it there. The food was just as amazing as the wine (I even brought back some Madeira in my suitcase). I was looking through the cookbook for some inspiration and the tomato jam recipe jumped out at me. After much google searching and a few trials later I had perfected my own recipe which I’ve shared below. This summer my tomato plants did REALLY well and there is only so much tomato sauce a girl can make. 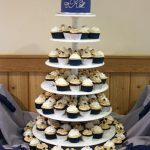 So I decided to make large batches of the jam and can it. Since it has lemon juice added the acidity is high enough to water bath can (at least that is what all of my research has said). 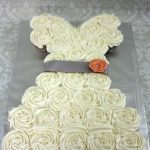 Most importantly, this recipe inspired me to make a cake out of the concept. I call it the Doce de Tomate cake, and it’s made with tomato sauce, cinnamon and a hint of Madeira. It will be one of the recipes in my next book so if you like the tomato jam you’ll love the Doce de tomate Cake! To start off you need about 4 pounds of good tomatoes. 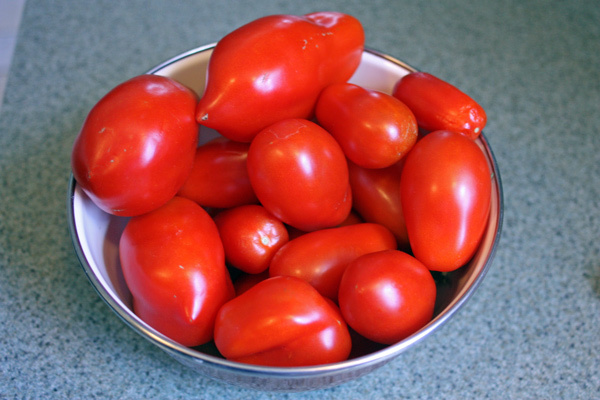 I used San Marzano since that is what I had in my garden, but Roma/plum tomatoes would probably work just as well. 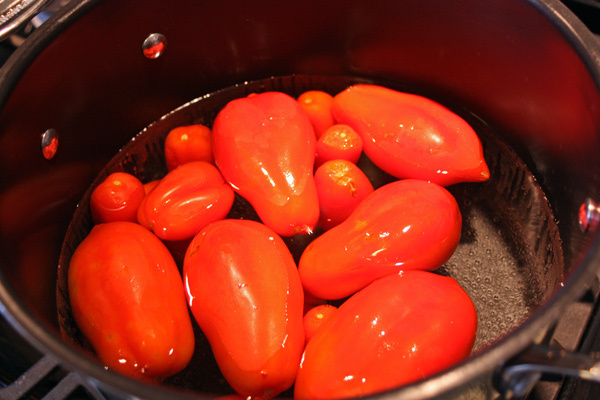 To easily remove the skins from the tomatoes I brought a large pot of water to a boil. Meanwhile I cut an X into the bottom of each tomato. Boil the tomatoes (I had to do them in two batches) for about 1-2 minutes then remove to an ice water bath for another 1-2 minutes. Smaller tomatoes can be left in for the shorter amount of time but larger ones will probably need the full 2 minutes. 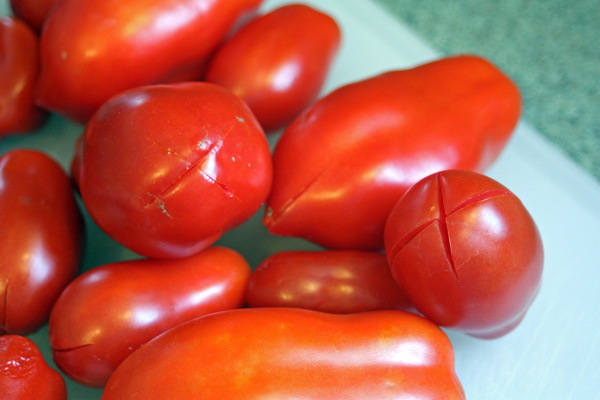 The skin should be pulling away from the tomatoes so that you can easily peal it off. 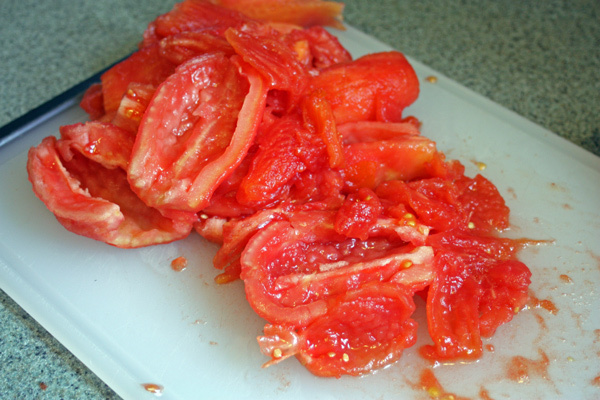 Remove the skins from all of your tomatoes and discard (I put my in my compost bin). Next remove the ends, cut in half and scoop out the seeds. A few seeds here and there is ok, but you want to get rid of most of them. You should not have a little over 2 pounds of tomatoes left. 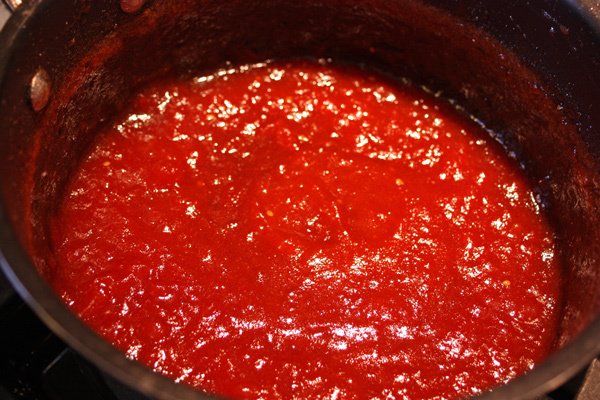 Roughly chop the tomatoes and put into a pot along with sugar, lemon juice and a cinnamon stick. Bring to a boil for a few minutes then reduce the heat to medium-low. Boil for about 1.5-2 hours until the jam begins to thicken. It will thicken further as it cools, and even more so once in the refrigerator so don’t over do it. Towards the end of the boiling I use an immersion blender to get it nice and smooth (be sure to remove the cinnamon stick first). This step isn’t necessary but if you like a nice smooth jam rather than a slightly chunky one then I recommend doing it. Just be careful not to spatter the hot jam! 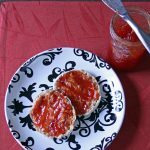 You can can the jam, this recipe makes about 24 ounces worth (give or take a few), or just store it in the fridge or freezer. 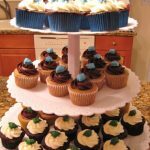 If you love Doce de Tomate jam, be sure to check out my cake version available in my eBook Cakes without Borders. Bring a large pot of water to a boil. Meanwhile rinse the tomatoes then cut a small X in the bottom of each one. Drop the tomatoes into the pot of boiling water and boil for 1-2 minutes, then place them into an ice water bath for another 1-2 minutes. You may have to do this in batches depending on how large your pot is. 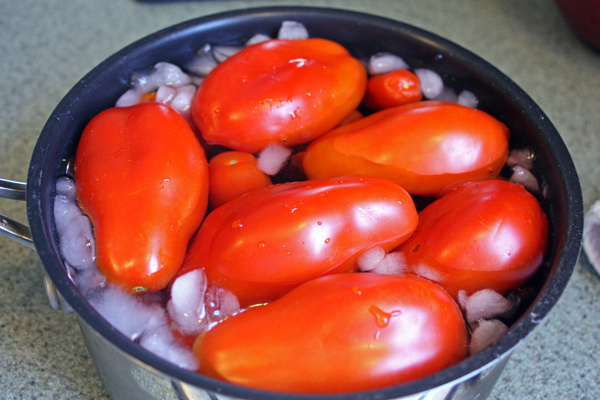 Remove the tomatoes from the ice water and remove and discard the skins. 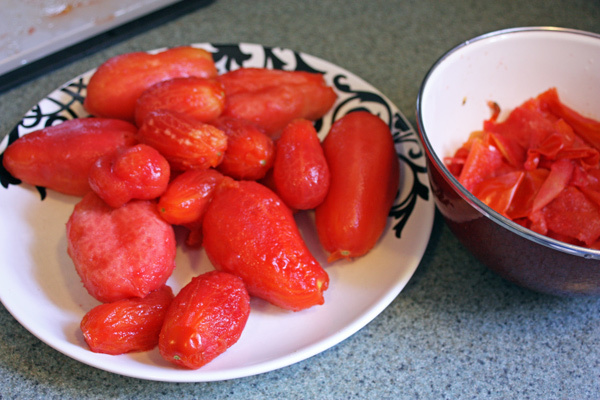 Slice each tomato in half and remove as much of the seeds as possible. 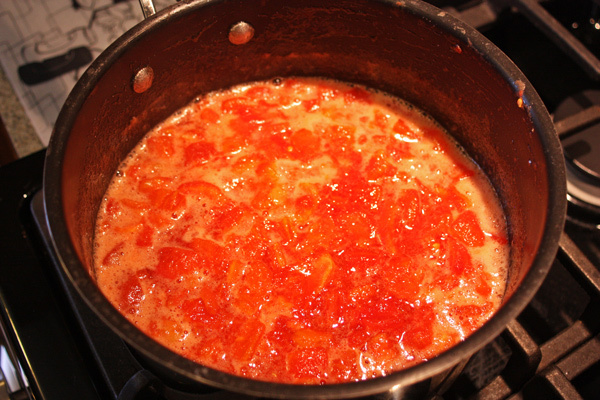 Roughly chop the tomatoes and put into a pot along with the sugar, lemon juice and cinnamon stick. Bring to a boil for a few minutes then reduce the heat to medium low. Cook for about 1.5 - 2 hours until the jam begins to thicken. You can use an immersion blender to puree any remaining large chunks for a smoother texture. 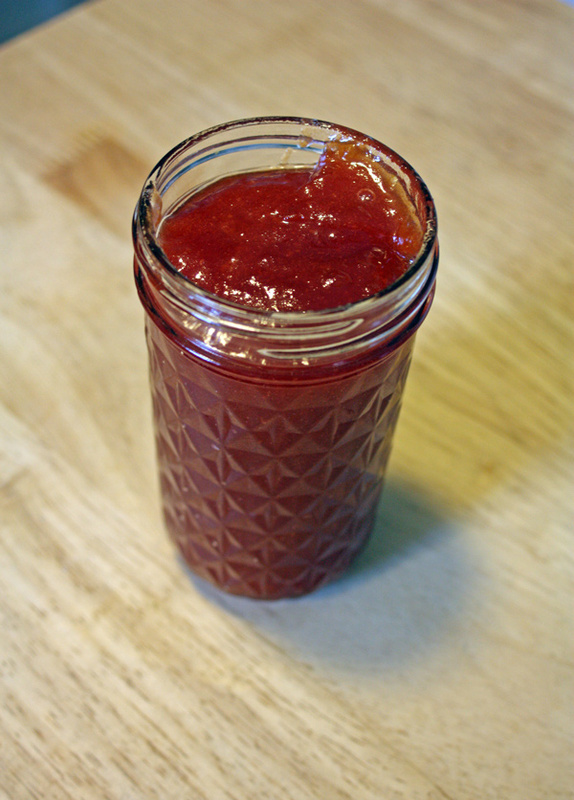 If you are canning transfer the hot jam immediately into your jars and process in a water bath canner. 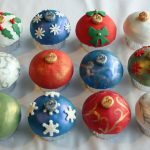 Otherwise allow to cool and then freeze or refrigerate in an airtight container.